Show your Fulton Schools and Sun Devil spirit before ASU football takes on Stanford at the Fulton Schools Tailgate! Be sure to register for food and the chance to get free football game tickets (faculty and staff only)! Register to attend — Registration ends at 11 p.m. on Wednesday, October 17, 2018! Only registered attendees will be eligible for free food! Faculty and staff are eligible to receive up to four football game tickets, one for yourself and three guests. 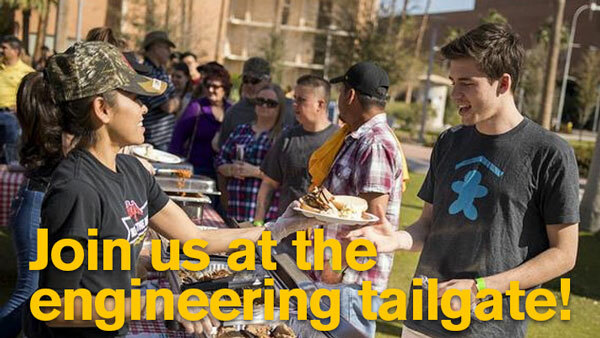 Engineering students are welcome to attend the tailgate for food, spirit and fun! Volunteer and help us make the event a success! Help with the fun and games, check-in guests and have a great time at the tailgate!